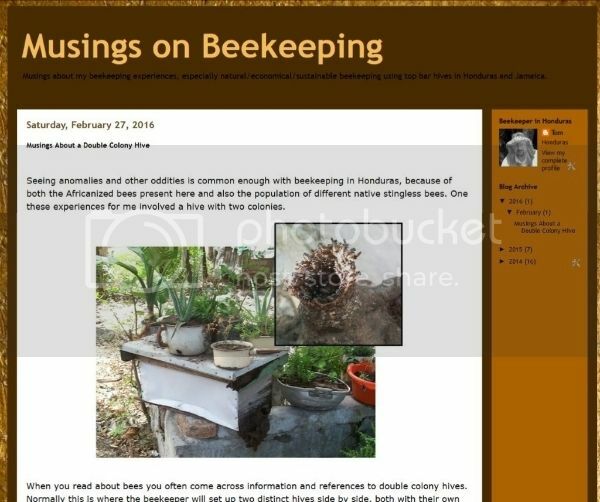 Seeing anomalies and other oddities is common enough with beekeeping in Honduras, because of both the Africanized bees present here and also the population of different native stingless bees. One these experiences for me involved a hive with two colonies. When you read about bees you often come across information and references to double colony hives. Normally this is where the beekeeper will set up two distinct hives side by side, both with their own queen but who share a common stack of supers. Mine was a bit different—being that it formed naturally and with two distinct types of bees. Interesting, I only remember apis melifera during my three months in Belize many years ago. In a Peroni Hive just outside Cambridge there are two colonies at opposite corners of the brood box. Helen who manages those bees with me went to put a swarm in and found that one had already moved in but having nowhere else to put them walked them in anyway and the two colonies have set up in opposite corners. I am looking forward to seeing what they are up to in a couple of months time when the weather here warms up.